This example shows how to deal with multiple ArtNet DMX 512 universes using Teensy 3.2, WizNet 820io and FastLED to light up an LED array using output data from Resolume. Download the Teensy code here: http://milkcrate.com.au/_other/downloads/arduino/artnet_multiverse_fastled.ino. Resolume Arena can output one or more DMX universes via ArtNet. This data can be read by a Teensy 3.2 using a WizNet 820io Ethernet module. The universes hold RGB LED data, where one universe with a maximum channel count of 512 can represent 170 RGB LEDs (i.e. 510 channels of data). In the ArtNet DMX protocol, each universe has an address differentiated by a net (14-bit), subnet (4-bit) and universe number (4-bit). The assumption is made that all devices in this example reside on the same net, so the net byte is not checked or compared. A given Teensy 3.2 has a user-defined subnet, between 0 – 15, and can respond to data that populates up to 16 universes. For the sake of LED framerates, it is not adviseable to go beyond 4 – 6 universes, or 680 – 1020 LEDs in total. Each universe for a given Teensy 3.2 has the same number of LEDs, from 1 – 170. A Teensy 3.2 is used, along with a WizNet 820io Ethernet module. In terms of LEDs, many different types are available, based on WS2811 or similar drivers. See the FastLED library for more details. In this particular example, a NeoPixel 24 Ring is used. The process of mapping multiple universes to one Teensy using Resolume as a data source is straightforward. In Resolume Arena, go to Output > Advanced Output. Create a new Lumiverse (or use an existing one). This is a universe of DMX data, but represented inside of Resolume, and relative to the composition output. 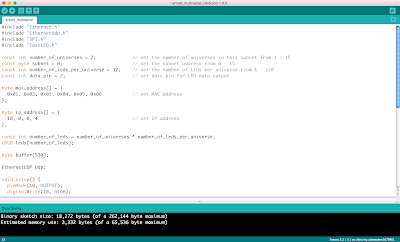 Create one or more new LED fixtures (or use existing ones), and populate the lumiverse with the same number of LEDs as defined in the “number_of_leds_per_universe” constant in the Teensy Arduino code. Create additional lumiverses as required, totaling the number of universes defined in the Teensy Arduino code. In Arena > Preferences, go to the DMX preferences tab. Create one DMX ArtNet output per lumiverse. 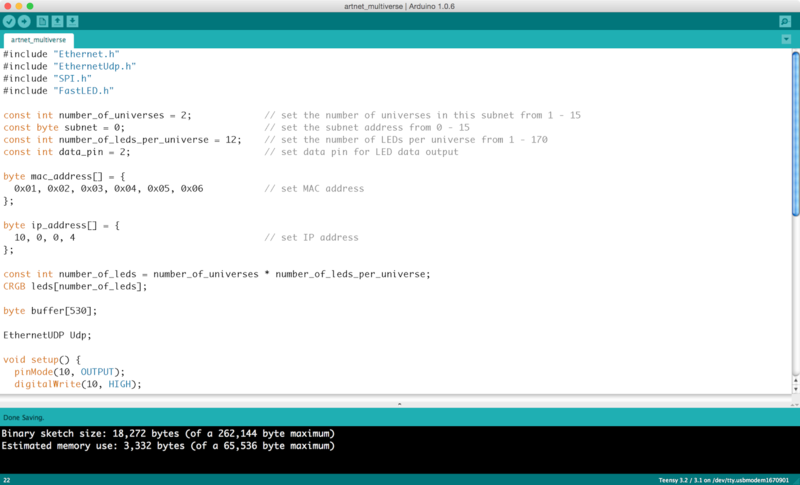 Each lumiverse must share the same subnet number (the same one defined in the Arduino code) and unique, consecutive universe numbers (starting at 0, with a maximum of 15).